David Mines has over 20 years’ experience in both the installation and manufacture of double glazing in eastbourne, establishing Britestyle, based in Stone Cross, Pevensey (near Eastbourne) many years ago. 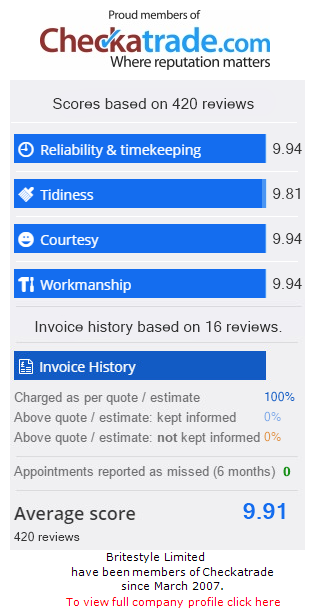 Britestyle’s reputation for giving value for money and commitment to after sales service means that over 80% of new orders are through customer recommendation. Every order placed with Britestyle is personally carried out or supervised by David, ensuring you receive the best attention at all times, without the hassle or sales pressure that is too frequently experienced with larger companies. Britestyle has an enviable reputation for offering value for money and a helpful and professional service. Supported by a network of manufacturers and suppliers, Britestyle only offers the best of the best. We hope this information will be of assistance when making your decision and that we can look forward to welcoming you as yet another satisfied customer. No salesmen – No pressure. Double glazed sealed units combine with the multi-chambered design of our frames, along with the well engineered gaskets and beading, to ensure that you have a thermal barrier which cuts down on droughts and prevents heat from escaping. Not only do we offer you one of the very best window systems available in Europe, but we also promise a top quality installation service carried out by our own fitters. All our products carry a full 10 year guarantee and are manufactured to BBA and ISO 9001 standards using the Rehau Profile range.